Aloha! In the last blog, I talked about when you may use oracle cards and how they navigate you to the direction you need to head. And today, in this one, I’d like to talk about how I receive messages via oracle/angel cards and how I do a “distance” angel card reading (I was asked by some friends to explain the process). I believe that the accuracy of card readings depends on how precisely a card reader can perceive the vibration of a client’s question, project it onto the cards, and feel the vibration of the responding cards. For this, I do meditation to empty my mind and chakra clearing with the help of the Archangel Metatron so that I can do my best during angel card readings. Since my service isn’t a face-to-face reading session, I ask for your home address and a photograph in which your eyes can be seen clearly. I look up your address on a map and memorize the location with your full name and face and call your Guardian Angel. (It’s always fun to meet a new Guardian Angel as Angels also have different personalities like us). I then share your question with your Angel and ask for cooperation and support so that I can receive accurate information from any Spirit during the reading. Then, I conduct the reading with your Guardian Angel. I feel emotions of Angels (Clairsentience) and know their thoughts (Claircognizance), and that’s how I communicate with any Spirit. Yes, it is your Guardian Angel who is the key player of a distance card reading! I offer three reading options: Indigo is for answering your question; Crystal is an overall reading with the message you need now; Rainbow is a thorough reading using multiple card decks. (Please visit this page for further details). For Indigo, I choose any format to answer your question. For example, I may pull a card or two from one deck, and then do the same thing from another deck. I continue this till I receive a clear answer. When a question is very specific, I may choose the five-card spread. For this, I pull five cards: Current Situation, Your Expectations, Hidden Influences, Advice, and Outcome. You will receive detailed information, such as hidden influences that affect the current situation and your true expectations in the situation. For Crystal and Rainbow, I most of time choose the three-card spread, so today I’ll explain a bit more about this spread. After I shuffle the cards, I pull three cards randomly—the cards those are appealing. The first one is the Past card, and it speaks about the (immediate) past with respect to the situation you inquiry about. The next one is the Present card, and it reveals your question’s current status. And the last one is the Future card, which shows your (immediate) future if you continue on your present path and follow the guidance of the Present card. What period does the Past or Future card represent? This depends on the circumstances. But, from my experience, once you’ve taken action on the guidance of the Present card and seen a change in the situation, you’ll be put in the situation revealed by the Future card. And during the next oracle card reading, this Future card may appear as the Past card, which means that you’ve entered the next phase. From the messages and impressions I receive from the card images and text to the feelings and thoughts of the angels, as I pulled the cards, I consider everything for preparing your reading results; sometimes, I get tears in my eyes or sit up straight, according to the emotions I receive. Important messages repeatedly show up over multiple card decks. 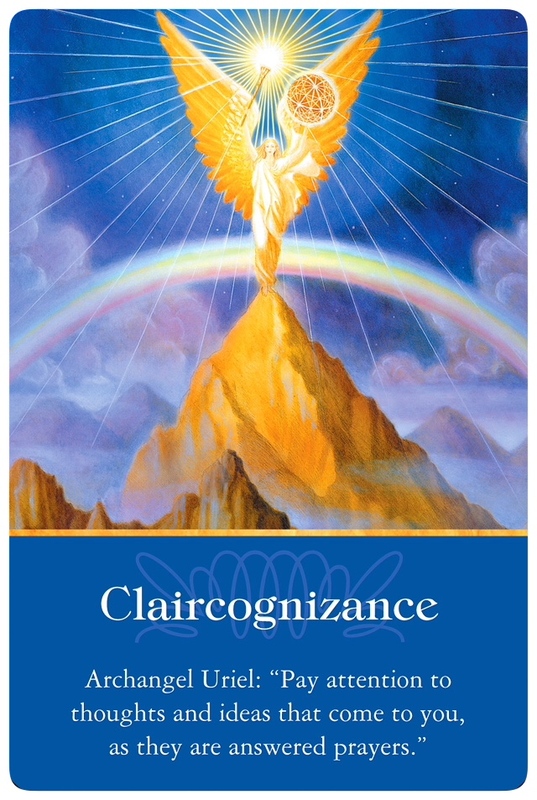 Also, the second card deck often delivers clarity of the messages given by the first card deck. To make the guidance of the Present card doable, I provide practical information based on my own experience and knowledge. 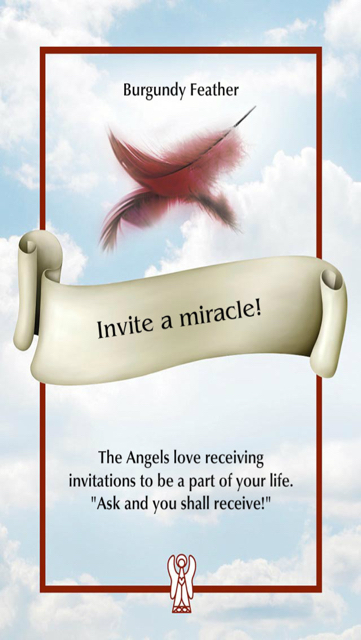 Example 1: “Invite a miracle!,” the card of the Angel Feather oracle cards, suggests that you’ll invite a miracle if you invite the angels into your life and ask for help. So, I tell you how to start communicating with and asking the angels for help. Example 2: “Meditate,” the card of the Ascended Master oracle cards, suggests that you better make time for meditation. So, I share guidelines for the type of meditation that suits your lifestyle. 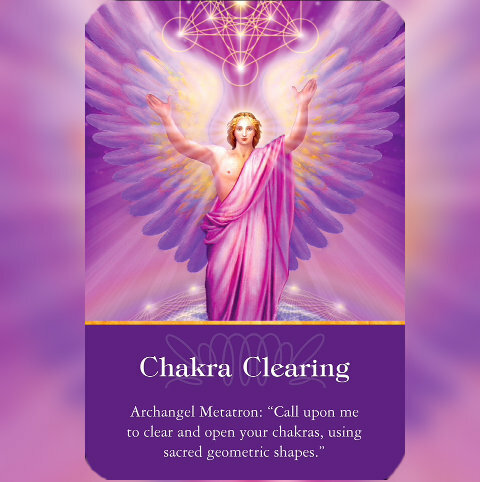 Example 3: When I pull the “Chakra Clearing” card from the Archangel Metatron of the Archangel oracle cards, I tell you how to ask the Archangel Metatron for chakra cleaning, how to receive it, and how it’d be like. I’d like to make the angels’ advice doable so that you don’t feel stressed when you need to make a change on the basis of the advice. For this reason, I do your Angel Realm Reading* as well. It tells me your natural character, tendency, and preferences, which allows me to think about the easiest method for you. *What is Angel Realm Reading? Dr. Doreen Virtue says that there are patterns (angel realms) of souls in this lifetime on the basis of their past lives. By looking into the realm, you understand action patterns; personality, including strengths and weaknesses; and natural talents of the person. I embed Reiki, the healing energy, into the reading results and ask your Guardian Angel to deliver the Reiki when you read the results. Well, that’s all! What do you think about this article? I do my best for understanding your situation with the help of your Guardian Angel and deliver the information you need to make a change in your life—to live your life purpose and be yourself. If you have any questions about the process I follow for your reading, feel free to leave a comment here or please send your questions via the Contact Me form. 🃏If you’d like to try a Healing Reading, please click HERE to check the Healing Reading options and send your request by using the Request form . 🃏If you liked this blog, click HERE to subscribe to my blog page via email. Thank you for liking my blog!